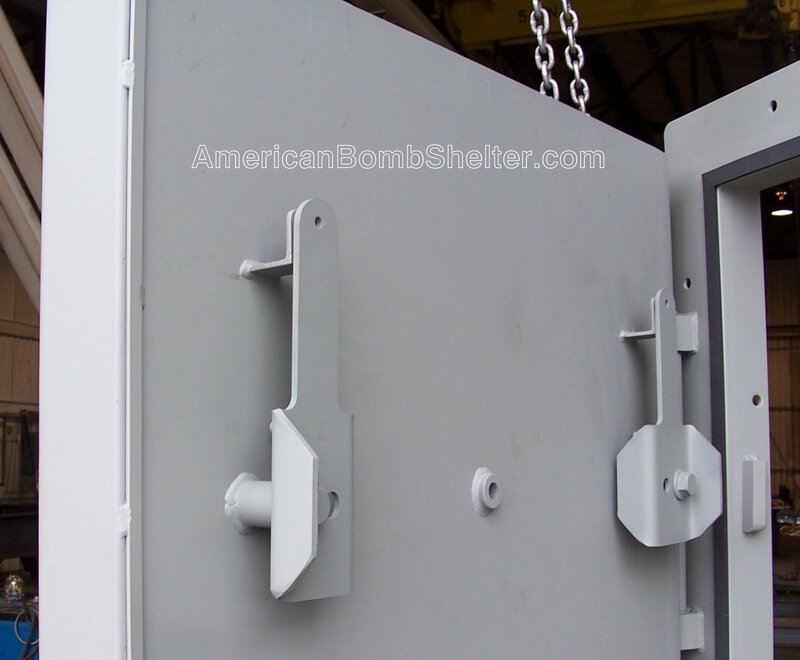 American Safe Room manufactures this pre-hung single leaf blast door that is engineered to protect your shelter from the high pressure blast waves produced by a large conventional or nuclear detonation. They also are designed to protect against malicious people and fires. 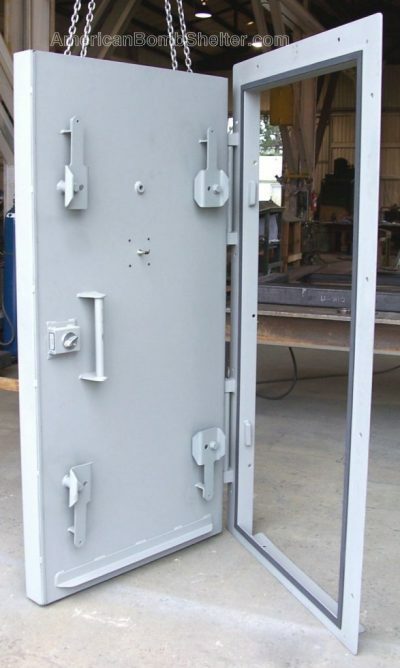 The door features four inches of concrete that resists structural fires, cutting torches, and has a UL level 8 ballistic rating – multiple hits with a 7.62 NATO round with no penetration. 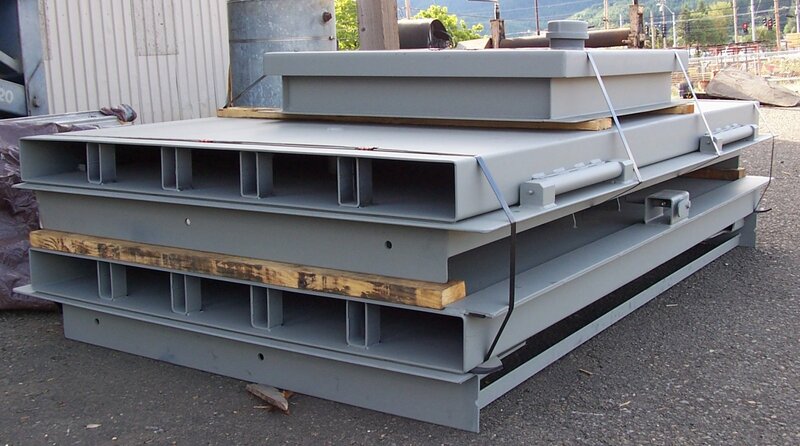 The standard frame is designed to bolt to the wall with high strength concrete wedge anchors. If you choose the assault resistant cam latch option, you also get the wall capture brackets which give you the security of a poured in place door with the ease of installation of a bolt on door. The standard sizes are 32 by 72 inches and 36 by 80 inches. These dimensions are the outside of the frame lips that insert into the opening in the wall. You need to make your wall opening a little larger that these dimensions – see the manual for more information. 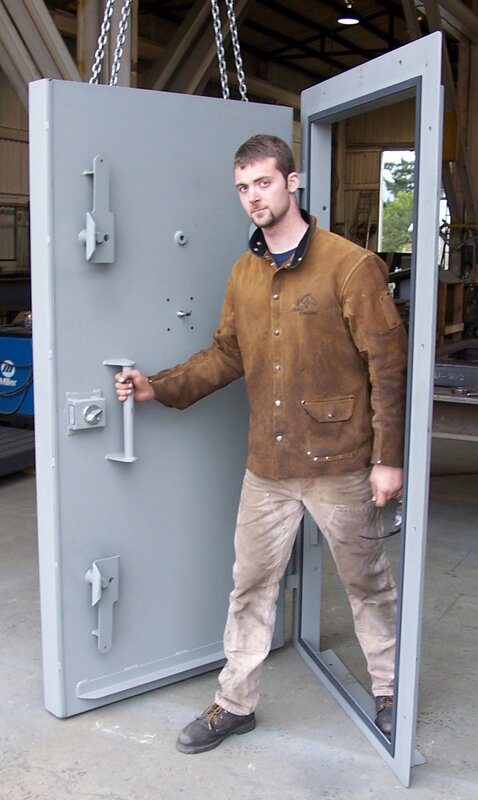 We have built many custom sized doors. If you have an existing opening that needs a blast door, please contact us. This is a 38 by 80 inch door with a bolt-on frame and a stepover threshold. It features assault resistant cam latches, a wide angle viewer, an inset deadbolt, and the differential pressure gauge will mount just below the viewer. 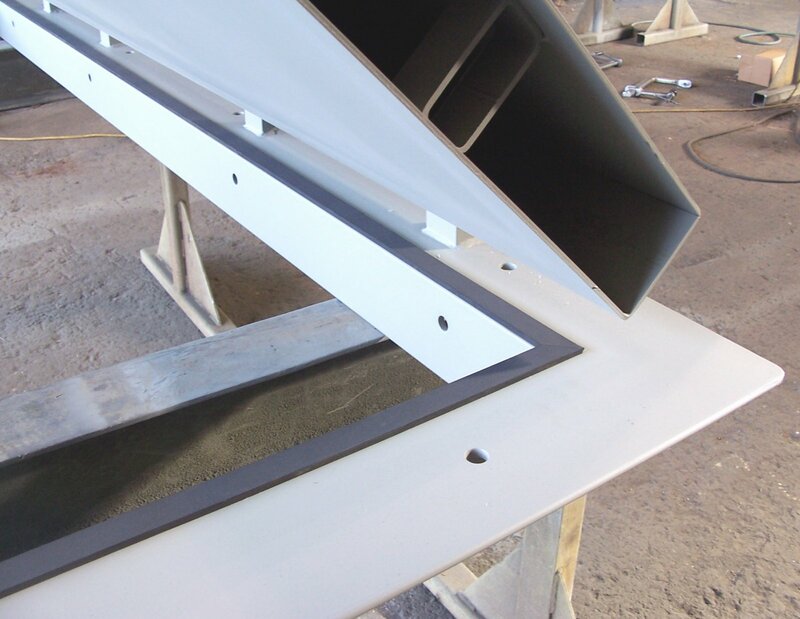 On our standard 50 PSI blast doors, the 3/16 inch steel envelope is filled with concrete after you hang it in place. 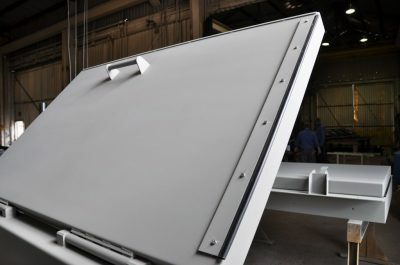 This keeps the door relatively light for installation, but puts a lot of dense mass between you and whatever threats are outside your shelter. 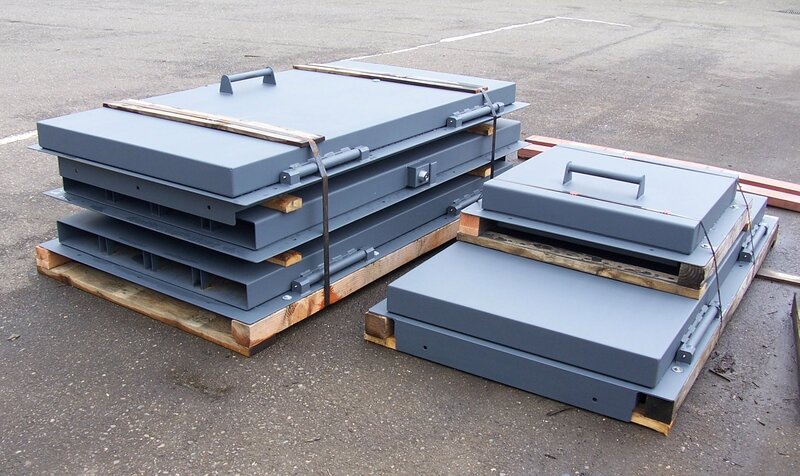 A 36 x 80 inch, 50 PSI door will be about 650 pounds without concrete and about 1700 pounds when filled with concrete. 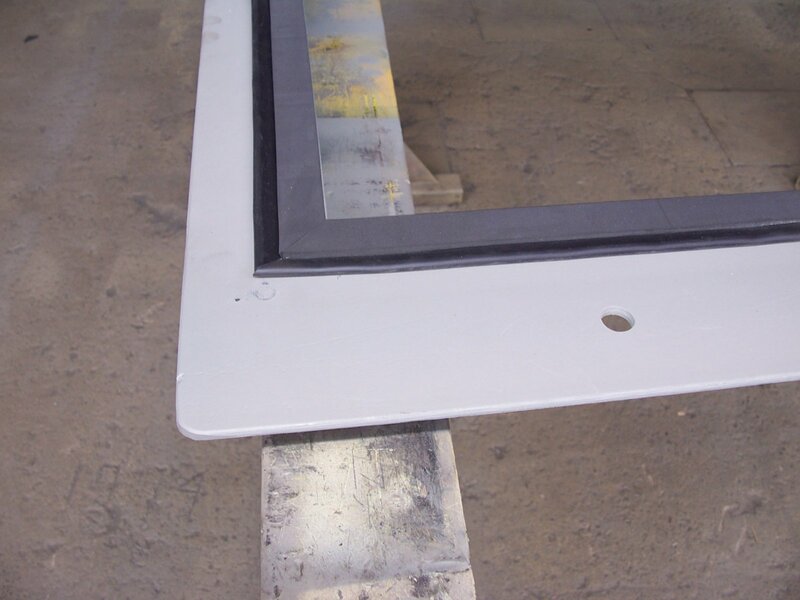 On larger doors or doors that require a higher blast rating, we increase the thickness of the skin. We’ve built doors with an 8 inch concrete fill and a skin thickness of 3/8 inch. The massive hinges have one and a half inch shafts captured by bronze bushings that are press fit into steel blocks and are packed with grease – and they feature grease zerks so that you can keep them lubricated for smooth, effortless opening. The hinges alone weigh 30 pounds per leaf. 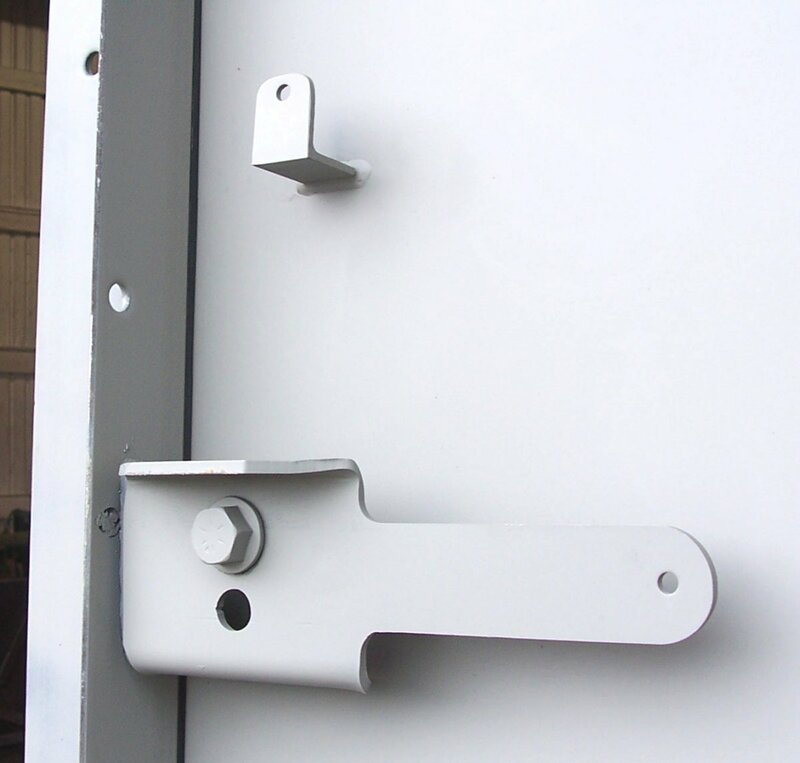 The cam latches are rotating handles on the inside of the door leaf that engage a cam welded on the frame. They operate in opposite directions in case the door is subject to violent movements by a detonation – one may loosen, but the other one will tighten, holding the door in place. The picture above shows the latch in the closed position. Note the bracket on the door leaf above the latch that allows you to lock your latches in the open position with a paddle lock. The hole in the bracket correspond with the hole in the cam latch handle. 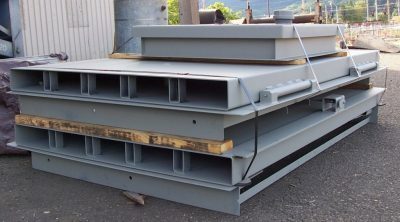 The picture below it shows the latches in the open position over these brackets. Most machinery and large tools have a “lock out” function for maintenance. This duplicates that function in case you have to give someone access to your shelter who may try to lock you out. We incorporated this feature on all doors after a customer with a teenage son inquired about a way to ensure he was not locked out of his shelter. These doors are made to be as difficult as possible to penetrate from the outside. Calling a locksmith or the fire department to extract someone who locks themselves in your shelter is not a good way to keep your preparations hidden. And, whomever you call would have a difficult time breaching this door. They would not forget the experience. 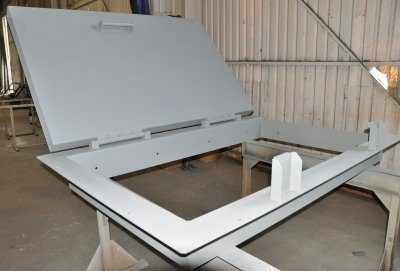 The concrete filled door leaf is impervious to cutting torches, 7.62 NATO rounds only make it half way through, the assault resistant security latches hold the door in place if the hinges are cut off, and the wall capture brackets hold the frame in place if the outside fasteners are removed. This is the door you want to stand behind when it hits the fan! These doors features a synthetic rubber seal between the door and the frame allowing for the use of a positive pressure NBC filtration system inside the shelter. The inside cam latches draw the door into the seal as they are rotated. This puts the seal under compression between the door leaf and the frame. 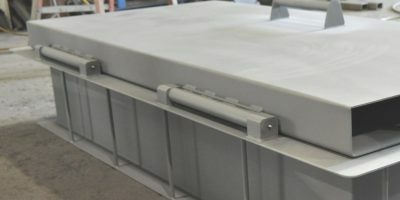 The strict tolerances we hold allow us to use a closed cell EPDM foam seal – not the bulb (automotive type) seal commonly used when manufacturers can’t hold the tolerance necessary for a solid seal. This seal is expertly applied without stretching it and the corners are cleanly chamfered to seal out airborne toxins. This inward swinging door has a flat threshold with an adjustable sweep, a deadbolt lock, and an inset pull handle so that an outward swinging wooden door can be mounted over it to hide the shelter entrance. There is no extra cost for any of these threshold options. See page eight of the manual for detail drawings of these thresholds. It took just 20 pound of force to open a 2,300 pound door. 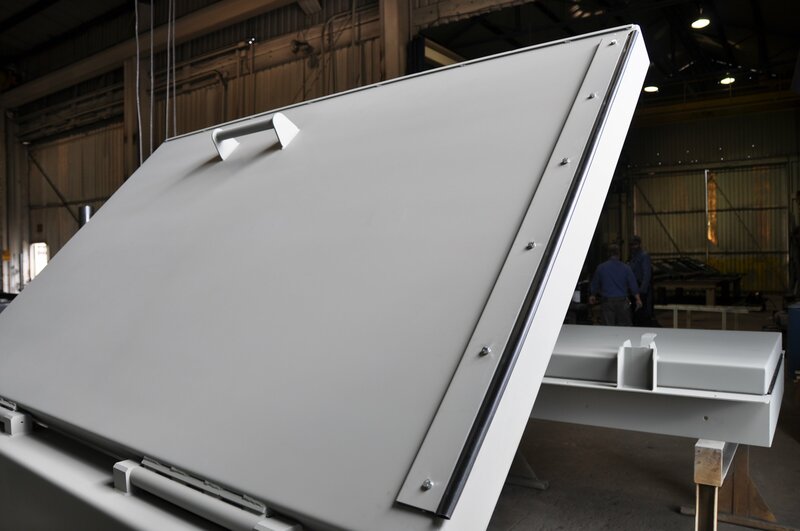 This is due to our bronze bushings, grease zerks, and how straight we can keep the door leaf and frames because we form the steel using a press brake – which keeps the hinges and latches from binding. Special order item: we usually need four weeks of build time per door. You arrange a 50% deposit at time order, we build the part, you arrange payment for the balance due, and we ship it right out and send you the tracking number. See our policy page for the full set of terms. We’ve placed a lot of these doors in industrial applications: chemical plants, foundries, ordnance storage magazines, ordnance testing ranges, refuge chambers, and even a rhinoceros enclosure at a zoo. See this page on our dedicated blast door website for a list of these doors. If you have an application that needs to protect from, or to contain a detonation, please contact our sales department.